I am in Germany for an international workshop (details here) and presented some of my work on porticoes. Unlike the majority of presentations last year, I presented from a manuscript, as I wanted to stay focused on some key points of discussion. I had not originally planned to discuss porticoes (was going to save it for another paper), but did not have the time to develop my work on the Vicus Iugarius in Rome to a presentable point. The majority of questions following the paper were aspects of clarification, many of which were due to my ownpresentation style. I continually struggle with a good balance between spatial theory, physics of sound, and my case studies. In this paper there is a clear preference on the theoretical framework, at the expense of the physics of sound and sound analysis. I have included a summary of the discussion following the paper at the end. [Title Slide] Thanks to the organisers of the session and to you all for being here. [Lefebvre Rome] At several points, Henri Lefebvre makes reference to two topics taken up in this paper: the senses and Roman space, although neither is in reference to the other. For Lefebvre, following Nietzsche and Marx, the senses are theoretical tools for understanding space, while Rome serves as a concrete example of the social production of space within Lefebvre’s history of the city. In this paper, I take Lefebvre’s twin suggestions as a starting point for a theoretically informed interpretation of Roman urbanism. That is to say, the senses serve as tools for understanding the reciprocal influence of the body and space in the formation of urban experience. Using the senses as a theoretical tool, following Lefebvre, I want to make this argument: by placing the sensory experience of street acoustics under the microscope, I argue for an experiential agency of portico space that is shaped by physical architecture, bodily movements and literary perceptions. Each of these aspects will be addressed in that order and set the framework for the argument of this paper. In this way, I draw together the two elements of Lefebvre’s suggestions and argue for experiential agency as sensory perceptions of urban space and its formation of the Roman sensorium. [Lefebvre books] Let us begin by listening to Lefebvre and bringing his insights in line with recent emphasis on kinaesthetic and embodied forms of knowledge. Recent studies of Roman space and spatial concepts have drawn primarily from the work of Henri Lefebvre. Writing in the late 1960s to mid-1970s, Lefebvre formulated the groundwork for what was letter termed the ‘spatial turn’(See Harvey, Social Justice and the City (University of Georgia 1973); Soja, Postmodern Geographies (Verso 1989)). Lefebvre suggests a ‘pedagogy of the body’ that ‘would connect the conceived to the lived (and conversely), assumes a form of qualitative knowledge still in a state of germination and promise. Rhythmanalysis, for example’. The invocation of rhythmanalysis draws the senses and times into this ‘pedagogy of the body’, as the rhythmanalist ‘thinks with his [sic] body’. This further elaborates the nature of Lefebvre’s tripartite division of space between the conceived, perceived, and lived. The knowledge derived from the connection of the conceived and lived is sensory knowledge. Lefebvre draws on smells and musical metaphors to describe the rhythmanalist’s methods and emphasises the measurement of space by the body. Lefebvre does not develop these ideas into a method and they are scattered throughout his diverse writings. Here I want to draw in some more work, which grounds these ideas in movement and embodiment. [Libet Diagram] By the end of the 1970s, several experiments had verified that between an event and our sensory experience there was a half-second delay. In following experiments it was further confirmed that unconscious reactions had delays of 100 ms, or a tenth-of-a-second delay. What this suggested is that conscious reflection or action based on sensory stimuli was, in fact, a reflection on a past event, all be it a very recent past event. To put this in Lefebvrean terms, lived space precedes conceived space in its mediation by the senses. Or simply, we sense the world before we act, think or reflect on that world. This places human agency at the start of interactions with the built environment, rather than beginning with language or thought. I like the emphasis on agency; performative acts do ‘something’ to space (I am also keen to keep the ‘something’ ambiguous). Here reflexivity becomes important, especially in terms of atmosphere and the social action of participants. I want to extend the reflexivity to the space of action, as well as the action itself. The reflexivity of architecture coincides with the reflexivity of the senses. In my own work, I stress the role of architecture in social construction based on auditory experience; the human bodies auditory system interprets space in the act of hearing. At the same time, what, where, and how we hear are part of the social and cultural understandings (habitus) we learn through repetitive experience of space. [AC & TL] The embodied knowledge carried within a cities inhabitant’s places agency as central to knowledge formation. Simply put, human agents create the social, cultural and physical world through sensory experience, first unconsciously and then through cognitive reflection. However for Romans to be social agents a mass of infrastructural material must already be in place. The infrastructural materials can be assessed and measured to analyse the kinaesthetic experience in terms of comparative figures. Physical dimensions and construction materials shape the auditory experience of the streets, which can be measured using modern acoustic design tools. [EB Book] In my chapter in Eleanor Betts’ recent publication, I focus on Absorption Coefficient (AC) and Transmission Loss (TL). I explain the physics of these measurements in that chapter and here point out the basic difference as sound reflected, AC, or sound passing through the material, TL. [Augustus] The reflection, resonance and other auditory effects of sound create the experience the body interprets in the half-second delay. These auditory effects are directly related to the dimensions, size and shape of urban space. In particular, I want to look at the basic architectural structure of streets in Ostia, with some comparisons to Pompeii and Rome, to assess the kinaesthetic experience and knowledge potentially created. [Ostia] At the scale of the city, by the second century CE Ostia had developed beyond any formal grid system. 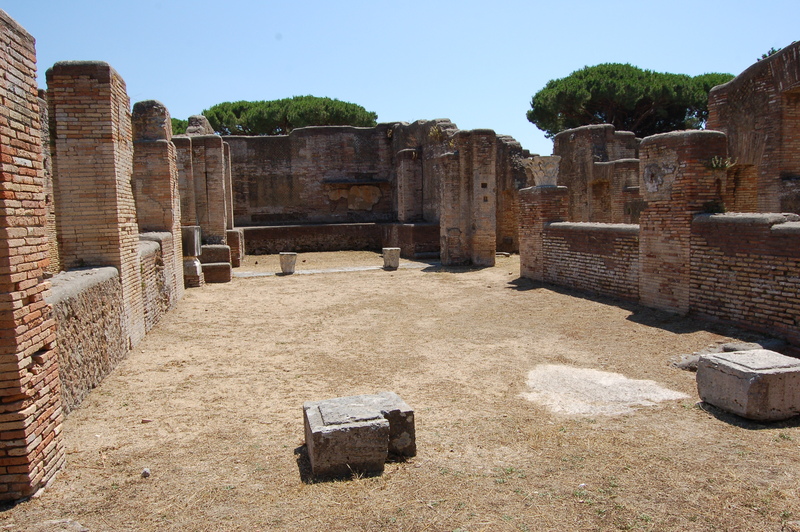 However other forms of standardisation were at work within Ostia. Ellis has shown a clear preference in Ostia for shop entrances on the right-hand side of the threshold. Street widths in Ostia display an uneven geographical distribution, same as Pompeii, although with a clear preference in width of 4-6 m. However Ostia has a limited number of streets roughly 8 m in width, the other major grouping in Pompeii. Instead, 94% of the streets in Ostia are less than 7 m in width. The widespread use of basalt on streets across Ostia suggests a certain foundational auditory experience, as the absorption coefficient is low (0.01-0.02) and sound would reflect off the surface. In terms of auditory experience, the limited range of widths in Ostia suggests building height and architectural elements being prime motivators of auditory differences. Unlike Pompeii, street architecture, such as benches and sidewalks, are primarily reconstructed and there are limited remains for analysis. [Portico map] Porticoes appear in Ostia, although again, in an uneven geographical distribution across the city. Beginning in the early 2nd c. CE, several large-scale building projects, with associated porticoes, began to reshape the city’s urban experience. Unlike benches, fountains, or shrines, porticoes create a space of experience defined by the architecture. The semi-enclosed area is experienced as acoustically separated space from the roadway beyond, even as sounds will pass between the two auditory fields. In this way, the two auditory fields influence each other. Sounds from one bleed into the other. What becomes an issue is the terminology and language of description, which we will return to at the end. [Sound dissipation] Turning to the kinaesthetic experience of porticoes and streets in Ostia, the acoustic properties of street canyons can be modelled using based on the materials and dimensions of the street. Here the sound dissipation on 3 streets, all with porticoes along some part, is modelled. Measurement is made based on a noise in the centre of the street. The Decumanus is the widest (10 m), while the N Cardo is the only street with porticoes on both sides for the whole length (130 m). What the graph indicates is the steep dissipation of sound in the Decumanus, while N Cardo mimics this experience due to the addition of porticoes. In the case of the Via Epagathiana, with a portico on one side and for a limited length the dissipation is skewed on one side of the graph. However, the experience of sound in all three streets shows similar trends. Chronologically, the N Cardo is the earliest large-scale redevelopment with a portico as a defining feature in Ostia (116 CE). Porticoes are constructed along the neighbouring Via dei Misuratori del Grano and Via della Fortuna the next year (117-8 CE), while the forum is finished in the 120s. [Portico chronology] It is worth briefly concluding on the chronology of porticoes and shop standardisation outside of Ostia. Pompeii does not have any porticoes along it’s streets in the 79 CE plan. Rome, on the other hand, sees two distinctive groupings of portico construction, namely the late Republican/Augustan period and the Flavian period. However these porticoes were a distinct architectural form, one that does not continue after the Flavian’s in Rome. In roughly the same time period, the regulation of street porticoes is prescribed following the 64 CE fire in Rome. While the literary sources, from the 2nd c. CE (Tacitus and Suetonius), set the motivation for porticoes in the need to control and prevent fires, it is worth noting that it is in the same time period as the last series of portico structures. Here the distinction between experience, in the streets of the 2nd c. CE, and narrative reflection, instigated in the 1st c. CE, is evident. Returning to Ostia, it is not during the Flavian period that porticoes begin to appear but rather at the start of the 2nd c. CE. That is to say, the experience of the portico street was an experience in Rome that reappeared between Pompeii’s destruction and the start of Ostia’s large scale rebuilding. That the auditory experience is important is obvious, however the connection of that importance to understandings of Roman space is subtler. At the start of this paper, I drew on Lefebvre’s suggestions to use the senses as theoretical tools and the role of Rome in the production of (social) space. Porticoes, I argue, serve to bring together these two points. I noted the unconscious experience of space as being the first point of interaction between humans and the built environment. In the case of the N Cardo, the two porticoes lining the street created a comparable auditory experience to the wider and more limited portico frontage along the east Decumanus. The Via Epagathiana showed the way portico frontage, in that case on the west side, altered the auditory experience of the street. Further study of other streets and porticoes will nuance these findings further. [Concluding slide] Finally, I want to end with a brief comment on sensory and spatial metaphors as ways of describing the changes in perception. Out of the experience of space, and in particular the changing experience of streets at the end of the first, beginning of the second century CE, Romans perceived of space differently, although not in complete rejection of previous perception. The associations and metaphors used to describe this translation of experience into literature give clues to the power these experiences could have. Today, we rely on visual and spatial metaphors to describe social relations and urban environments; cities are images, the public eye, we ‘map’ and ‘explore’ social relations and networks. However, these visual and spatial metaphors reduce spatial and social relationships to static and abstract understandings. In the translation of experiences of space to literary reflection vision is given power over other sensory experience. In the Latin literary context, the verb incedo and its noun incessus refer to walking, which also carries associations with bearing or how one carries oneself. The association of movement with comportment is key. In moving through the city, inhabitants carried themselves, or, in Bourdieu’s terms, enacted their habitus. By drawing movement and comportment together the metaphor places the power on walking, not seeing. The person walking/carrying themselves is the subject. What are necessary are a need to critically evaluate the experience of space, as I have tried to show, as well as the metaphorical conceptions of space. Non-visual, sensory metaphors offer a way forward in understanding the metaphorical architecture of Roman urbanism. 1. If sounds could happen anywhere on the street or in the portico, why is the model based on a sound in the centre of the street? i.e. carts, sellers in the portico, people walking in the street or in the portico. The model of the acoustics is based on generic sound (white noise, or sound across all frequencies) in a fixed location. This gives us the acoustic foundation from which we can then move to particular sounds. In this paper, I focused on the architecture along the street and the role of porticoes in altering street acoustics. I was less concerned with the catalogue of sounds possibly produced along the street. 2. As a medievalist, we have evidence for mud and dirt along streets and these would dampen sound. Is there any evidence of this in the Roman period? Short answer: no. There are anecdotal stories of magistrates not cleaning streets (Suetonius, Vespasian 5), legal regulations of what can be left outside of properties (Dig. 43.11.1.1), duties for magistrates to clean and maintain streets and sewers (Dig. 43.23.1-2). Mud and dirt would dampen the sound dissipation of the streets. 3. I am working on urban ecology, what would be the role of birds in your analysis or are there any studies on bird noise? I do not know of any studies of bird noises in Rome. Particular sounds, such as bird noises, can be modelled in the street space. These would produce different sound dissipation curves to the ones I showed. 4. a) You do not use the term ‘soundscape’ but surely it plays a part in the social porduction of space; b) you ended with [Latin] words, but these would be aspects of the perceived sense, in a theoretical definition of ‘perception’. For example, my husband could snore and this sound would bother me, but may not bother others. First, soundscapes: I am growing uncomfortable with the term [although, I have used it in publications]. I find its use unclear in defining its geographical extent and it being associated with cataloging all the sounds in a space (again, without reference to the flexibility of this term). That leads to the second point. Yes, ‘perception’ is culturally constituted and that is why I looked to Roman usage of metaphorical walking was associated with comportment. This offers a critique of our own reliance on visual metaphors to describe cities and urban space. Lefebvre, The Production of Space (Blackwell 1991), 399-400; a point also made by Terry Eagleton but with no reference to Lefebvre, Eagleton, Materialism (Yale 2017), 62-3.
 cité: Lefebvre, Metaphilosophy (Verso 2016), 142, 209-215; The Production of Space (Blackwell 1991), 239; see my own review of Lefebvre’s use of Rome and the ancient city at Ancient Noise (blog, jeffdveitch.me). Laurence, Roman Pompeii: Space and Society, 2nd ed. (Routledge 2007), 103. Laurence, Roman Pompeii: Space and Society, 2nd ed. (Routledge 2007), 107-9. Poehler, ‘Measuring the Movement Economy: A Network Analysis of Pompeii’, in Flohr and Wilson (eds. ), The Economy of Pompeii (OUP 2017), 204. Lefebvre, Towards an Architecture of Enjoyment (University of Minnesota 2014), 149. Lefebvre, Rhythmanalysis: Space, Time and Everyday Life (Bloomsbury 2013), 21. Lefebvre, Rhythmanalysis: Space, Time and Everyday Life (Bloomsbury 2013), 21, 27, 33. Lefebvre, Rhythmanalysis: Space, Time and Everyday Life (Bloomsbury 2013), 32; cf. Lebas and Kaufman, ‘Lost in Transposition – Time, Space and the City’, in Writings on Cities (Blackwell 1996). See Libet et al, ‘Subjective referral of the timing for a conscious sensory experience: A functional role for the somatosensory specific projection system in man’ Brain 102 (1979), 191–222. Libet et al, ‘Subjective referral of the timing for a conscious sensory experience: A functional role for the somatosensory specific projection system in man’ Brain 102 (1979), 191–222. See also Thrift, Non-Representational Theory: Space, Politics, Affect (Routledge 2008). Lefebvre, Towards an Architecture of Enjoyment (University of Minnesota 2014), 151. Lefebvre, Towards an Architecture of Enjoyment (University of Minnesota 2014), 41. Eagleton, Materialism (Yale 2017), 65-6. Eagleton, Materialism (Yale 2017), 67. See Veitch, ‘Soundscape of the Street: Architectural Acoustics at Ostia, in Betts (ed) Senses of the Empire: Multisensory Approaches to Roman Culture (Routledge 2017), 54-70. Ellis, ‘Pes Dexter: Superstition and the State in the Shaping of Shopfronts and Street Activity in the Roman World’, in Laurence and Newsome (eds.) Rome, Ostia, Pompeii: Movement and Space (OUP 2011), 160-173. Pompeii, Hartnett, ‘Si quis hic sederit: Streetside Benches and Urban Society in Pompeii’, AJA (2008), 110. Pompeii, Hartnett, ‘Si quis hic sederit: Streetside Benches and Urban Society in Pompeii’, AJA (2008), 110; Ostia, Veitch, Acoustics in Roman Ostia (unpub. PhD). See DeLaine, ‘Building Activity in Ostia in the second century AD’ in Bruun and Gallina-Zevi (eds.) Ostia e Portus nelle loro relazioni con Roma (AIRF 2002), 41-102 for discussion of large-scale building at this time. See DeLaine, ‘Building Activity in Ostia in the second century AD’ in Bruun and Gallina-Zevi (eds.) Ostia e Portus nelle loro relazioni con Roma (AIRF 2002), 41-102 for dates. Macaulay-Lewis, ‘The City in Motion: Walking for Transport and Leisure in the City of Rome’, in Laurence and Newsome (eds.) Rome, Ostia, Pompeii: Movement and Space (OUP 2011), 274. Macaulay-Lewis, ‘The City in Motion: Walking for Transport and Leisure in the City of Rome’, in Laurence and Newsome (eds.) Rome, Ostia, Pompeii: Movement and Space (OUP 2011), 274-5. Tacitus Annales 15.43.1-2; Suetonius Nero 16. Lefebvre, The Production of Space (Blackwell 1991), 40. Agricola 19-21⁠; Laurence and Trifilò, ‘The Global and the Local in the Roman Empire’, in Pitts and Versluys (eds.) Globalisation and the Roman Empire (CUP 2015), 103. See Smith and Katz, Grounding Metaphor: Towards a spatialised politics’, in Keith and Pile (eds.) Place and the Politics of Identity (Routledge 1993), 67-83; Massey, Space, Place and Gender (Polity 2002). Jenkyns, God, Space and City in the Roman Imagination (OUP 2013), 148. Porticoes: I have two upcoming presentations that I am working on (details here). Originally, I had planned to write two completely separate papers on different aspects of my work (motivating me to write and formulate more particular approaches, ideas, etc). Instead, the two presentations will draw on case studies of porticoes from Ostia. In preparing these presentations, I keep returning to the experienced difference of portico architecture within the social space of streets. At a basic level, the portico is shaded and separated from the street. In auditory terms, the portico and street are different auditory fields, however the two fields influence each other. When the acoustic properties of street canyons are modelled, in instances where porticoes exist, the properties show a marked progression towards the acoustic properties of Ostia’s main street, the decumanus. In a way, certain streets approach the auditory character of the decumanus with the addition of porticoes. The chronology further emphasises the experienced character of the space, which is replicated to various degrees in other places across the city. Streets that could never reach the scale of the decumanus are able to mimic its auditory experience through more controlled and smaller scale developments. I will be testing some of these ideas this next week, when I present in Kiel, Germany. Embodiment: Several books, lectures and writings have brought embodiment back to the forefront of what I am doing. I picked up Terry Eagleton’s new book, Materialism, and he makes a case for the importance of embodiment in Marx, as well as other forms of materialism. Tied into the emphasis on embodiment is the role of the senses as ways of measuring urban space or embodiment as site of particular forms of knowledge gleaned from the senses. These are not new ideas for me, but they are beginning to crystallise in particular ways (as well as focusing my generally scattered interests). Much of these ideas will appear in my presentations coming up, although they are primarily in the background and theory behind the presentations. Finally, street cries: Street noise is one of the primary topics in my work and one that I continue dig into. After the winter holidays, I read through a series of books on Paris in the 18th and 19th century. Street criers, sellers and vendors were a part of the landscape of the city in that period and changes to the architecture of Paris were expressed in relation to street noise. There are some parallels with the ancient world, although comparisons need to be cautiously approached. What I find most useful, however, is the theoretical implication of much of this work, which builds bridges between social, political and economic aspects of the senses and their spatial settings. In short, as the topography of Paris changes, the sensorium likewise changes; these shifts produce different social, political and economic spatialities. Rome, I would argue, undergoes parallel changes in many ways. To say that architectural changes that alter the topography of Rome change the experience of the city is obvious. However, what need further study are the particularities of these changes. How did the addition of porticoes change the way sellers utilised street space? What are the economic implications? Or social? Or political, for that matter? Do street traders change tactics in response to the development of porticoes along streets? Some of these questions have begun to be addressed in various ways. Sarah Bond’s new book, Trade & Taboo: Disreputable Professions in the Roman Mediterranean, address aspects of social stigmas towards criers and auctioneers (praeco). In particular, Bond emphasises the changing nature of such social stigmas from the late Republic to late antiquity. The emphasis on changing stigmas, parallels my own interest in changing urban forms. In a different context, Arjan Zuiderhoek, in The Ancient City (part of the Key Themes in Ancient History series), discusses (briefly) street sellers in terms of a wider understanding of ancient cities. Zuiderhoek covers a similar longue durée of ancient history, although he highlights continuity in city formations, focusing instead more on the archaeological material and current debates. Both are recent publications, which highlight some of the areas for further investigation. The conference I am co-organising is coming up this Friday! I am pretty excited to hear what our presenters have to share, as well as further network with the sensory studies in Antiquity folks. There is still some space left and it looks like it will be great day of discussion/research sharing among the growing number of sensory studies people in Classics/Ancient History/Archaeology/Digital Humanities. Details can be found here. Well, I’m almost done (fingers crossed) with the current chapter covering internal spaces in Ostia and the aural architecture of certain spaces. I touched on doorways in a previous post on common shops found along the streets of Ostia. I am now working through more complex buildings than the one room shop. Another common architectural layout for various types of buildings is that of an internal courtyard. These buildings, referred to as insulae, are usually large, multistory and multifunctional, both commercial and residential. The courtyard was usually a communal space, but in some cases only accessible from the ground floor. Again, because of the common occurrence of courtyards and the various functions of the buildings, the courtyards are another prime space for questioning the way acoustics can be utilised in various functional settings. While wrestling with ways of analysing an interior but open space, I came across a study of street noise and urban courtyards. It was an interesting look at the low frequency noise from streets being heard inside courtyards in urban settings. One of the aspects that stood out to me was the way the arrangement of the courtyard functioned as a resonator for certain frequencies of noise produced on the street. Simply put low frequency noises, which have higher wavelengths than high frequencies, would carry over the buildings and enter the courtyard. It seemed that the lowest frequencies could be heard at almost the same level in the courtyard as the street. Resonant frequencies, those frequencies that would resonant in the courtyard, produce increases in the sound level in the courtyard, while the sound propagation in street decreased. The study suggests that urban courtyards are not quite retreats from the noises of urban streets but in fact can be just as loud, even louder at certain frequencies. Returning to Ostia, this suggests that the internal courtyards of certain buildings would have a similar reaction to street noise. Low frequency traffic noise would not happen in Ostia but other low frequency noise and resonant frequencies would still fill the courtyard. In certain cases, doors and walls could block some of the sound waves, although this would not stop all noises (remember that the low frequency noise would fill the urban courtyards even when there was no doorway from the street to the courtyard in the model). Here again, we get yet another occasion where places thought to be quite or removed from activity still react and are filled with noise. Some of the internal courtyards in Ostia now seem to be even more active spaces than I initially thought. I was asked by friend why I refer to ancient sounds as noise and why this blog is titled Ancient Noise. Although they are two different questions, they come out of a shared understanding about the Roman world as perceived by the Romans (predominately through their architecture and literature). My own work on architectural acoustics argues that Roman construction, design and use of buildings was minimally concerned with ‘sound proofing’. The Romans did not have the knowledge, or means, of sound measurement or sound isolation. They could tell you something was loud, quite, annoying, pleasant etc. but they could not isolate sound the way we do today. They could, and did, make judgements about the sounds they heard around them but there was no standardised readings of the physics of sound. The modern ability to measure sound pressure levels (a measure of intensity) is a resent development, which was furthered by the realization that sounds at certain levels could be harmful. Once the connection between sounds and health was made noise became a problem. Noise is, therefore, unwanted sounds. Hence the vast array of law concerning noise control and standardised noise levels. I have no disagreement with this definition of noise. Unwanted sounds are noises. But for the Romans, who were unable to isolate sounds, both good and bad, noise is one of the primary sources for sounds that we have. We have complaints about all kinds of noises. Trumpets, carts, sellers yelling, people crying, weightlifters grunting and on and on. My interest in everyday rhythms means that I focus on these noises and the architecture that shaped them. It is the unwanted sounds that offer insight into the daily interactions, which produced those same sounds. In my work, all sounds can be classified as noise, since the Romans had no way, other than running off to an uninhabited area (which would still be filled with noises), to close out the sounds and noises around them. Hence Ancient Noise.